Are dodgy goals better than dodgy offsides? Surely we as fans want the right decision as opposed to one that favours any particular player? Well, Professional Game Match Officials Limited, feels that a linesman will get more stick for wrongly disallowing a goal than incorrectly awarding one. This move comes after the linesman Peter Kirkup wrongly flagged when Salomon Kalou got the ball in the net for Chelsea during the 0-0 draw against Blackburn in Jose Mourinho’s last league game a fortnight ago. On Wednesday night in the Carling Cup, TV replays showed a Diomansy Kamara “goal” for Fulham should have stood with the extra-time score against Bolton at 1-1. The incident sparked an outburst from Fulham’s manager, Lawrie Sanchez and Fulham went on to lose. What do you think of this proposal? Like any football fan, I imagine that I’ll be all in favour of it when it helps my team out, but will cry foul if it continually goes against. Is this kind of thinking going to confuse matters further, or is it a move in the right direction? Your thoughts are required as ever Pieheads. I think that referees should just call what they see, without the shadow of a doubt. 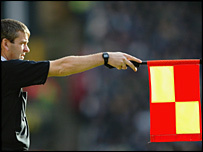 If they do not see an offside, or any other type of foul, they should not call it. Teams should not be punished by fouls they do not commit because the ref does not clear see the play and decides to guess what happened. Having said that, the off-side is a foul that can rarely be clearly seen by the linesman, as he would have to have an eye on the ball and another on the off-side line. If you do not allow them to make informed guesses it is going to be very difficult for any offside call to be made.